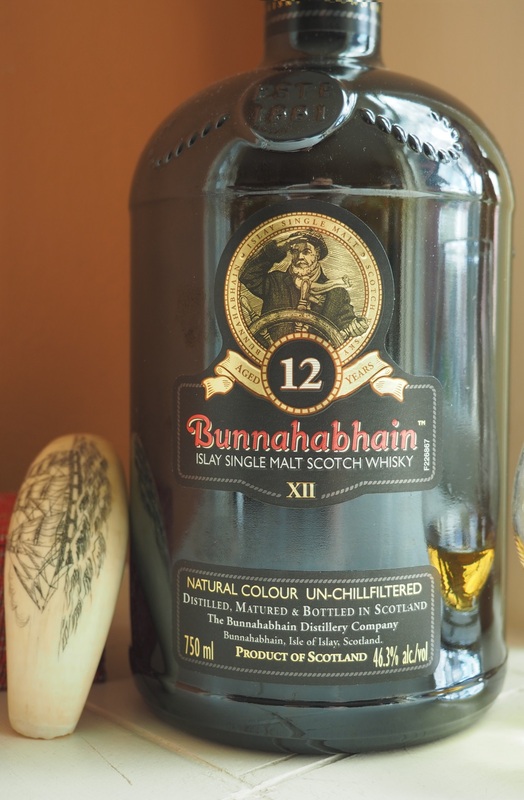 I first heard about Bunnahabhain while walking around Edinburgh back in 1992. I had been making my way down to high street from Nelson’s column on a Sunday. Not much was open, the skies were leaden, the city quiet. It wasn’t late but the light dim — it was November in Scotland, and that means short days. I was making the most of a day off after having done some business with Heriot-Watt University. 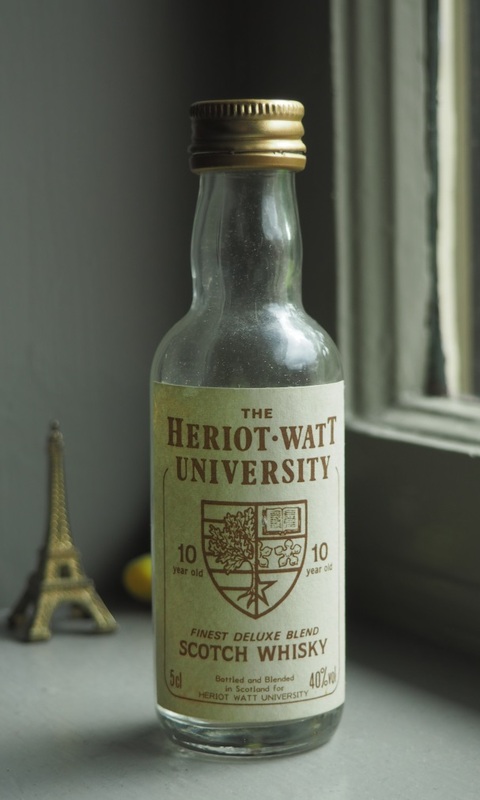 Heriot-Watt is notable for being the college where James Bond went to school. I heard that from another Bond fan, I’m not entirely sure this is so, but we’ll let it go for now. What is certain is that they are involved in the country’s business education and especially the whisky business. They even had their own bottling of whisky, and I brought back a sample. I have the bottle still, but the spirit is long gone, so no solid review of that, though I remember not being too taken by it at the time. Nevertheless I felt some affection and brotherhood towards my cousins from across the sea (being a long-lost MacNaughton, after all). I enjoyed my time there and took advantage of Sunday’s quiet to tramp all over town. While I stopped in front of a liquor shop’s picture window to gaze at the bottles, another gent wandered up and took station beside me. “It’s too bad they’re closed,” I said. My accent tagged me as an American but he didn’t seem to mind. “What’s your favorite?” I asked after some small talk. Bunnahabhain 12, with a maritime trinket, Maine scrimshaw. “Ahh, that’d be Bunnahabhain,” he said with particular feeling. I was struck by that — this was not just a Scotch he liked, but a Scotch he loved. And, as I had earlier with Bushmills, I let the merest of nudges lead me to be a Bunnahabhain drinker. That wasn’t so easy, back in the States. I did not see Bunna, as some call it, for some years after that, though when I did finally get a bottle I remember enjoying it — much more than the other single malts I tried at the time — Glenlivet, Glenfiddich, and Talisker (the latter too much for my then-tender palate). I didn’t drink much whisky then, having given up Bushmills and the Russians, but years later, with kids out of my hair and a touch more free time, I found myself getting into Scotch. Happily, that Scotsman’s good taste was reliable, and Bunnahabhain’s allure has passed the test of time. I still like it. Bunna is as noted elsewhere an Islay whisky without the commonly associated peatiness or smoke. It is also matured in sherry casks, so I think an interesting comparison would be to The Macallan 12 — a whisky I have noted is meticulously distilled, aged, and presented. There are a few differences: Bunnahabhain is these days presented in a non-chill-filtered final preparation, and slightly higher ABV (46.3%) than Macallan’s 12. 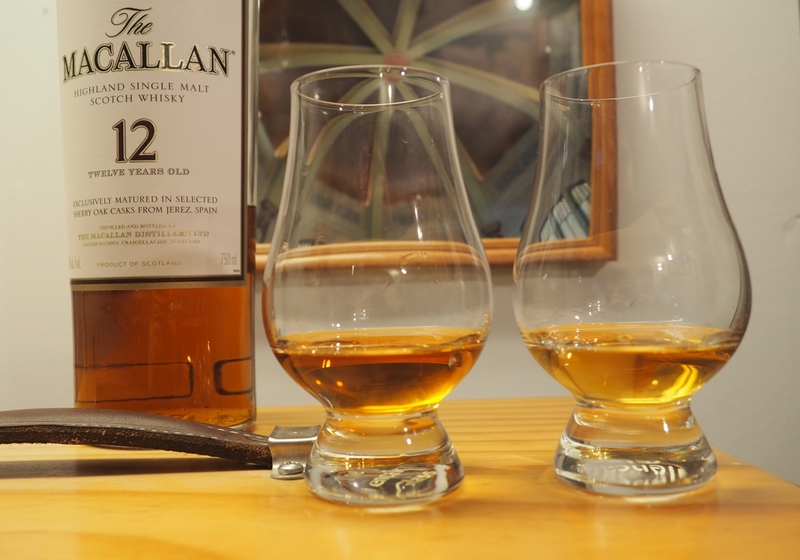 Neither has colorant, but you’ll note from the photo below, with the Macallan on the left, the lowland Maca has a bit more color. I’d lay that down to the Macallan’s more meticulous care in sourcing and using first- and second-fill sherry casks. Perhaps Bunnahabhain uses casks for more than two fills (Macallan stops at two), or uses a mix of sherry and bourbon, I don’t know, their new website design is quite short of details. The color speaks of something, but is it important?. Nose: Sherry and malt, some strawberry, mineral earth, the barest hint of smoke. No sting in the nose, despite the 46% ABV. Palate: Malt, toffee, a touch of cotton candy but balanced, not too sweet. Excellent structure, with the oak holding up the mid-palate while the sweetness lights up the front. No bitterness. Smooth, gentle mouthfeel. Finish: Gentle tapering of malt, balanced with oak and a waft of sherry fruitiness. More length to the finish than Macallan 12. Bottom line: More $$ than a lot of good sherried whiskies, but delivers the goods in depth, structure, and finish. And there you have it. While I still consider Macallan 12 the standard of quality for a sherried whisky, there are others, of course, which have more structure, a better finish, and often, a higher price. Such is the case with Bunnahabhain. I find the Bunna has more going on — the earthiness in the nose allows you to taste the terroir of the place (to borrow a wine drinker’s term); it’s the smell of damp earth of the land that made it, carried in the water. Macallan has a good nose, but it doesn’t have that. The Bunna’s palate has a great structure, balanced sweetness with oak, as does Macallan, but the Macallan has just a touch of bitterness which the Bunnahabhain doesn’t. And finally, the finish of Bunnahabhain lingers on, malt and oak and earth for far longer than the Macallan. Bunnahabhain is about 30% more expensive than the Macallan where I live, and that’s a fair bit. but for me it is worth it. Bunna is still my favorite of the non-peat monsters. I’ll be buying a bottle every year on my birthday and thinking of the one guy who longed after this dram with so much feeling. This entry was posted in Scotch-single malt, Whisky and tagged bunnahabhain, Heriot-Watt, Islay, Macallan, Scotch, Whisky review. Bookmark the permalink. Of all the islay drops out there I’ve probably had the least of Bunnahabhain. It’s one I’ve not really been able to classify in my mind. On the rare occasions I have had it I have enjoyed it by not…. got it. If that makes sense. Reading your review has really inspired me – I need to track some down to work out all those subtleties. 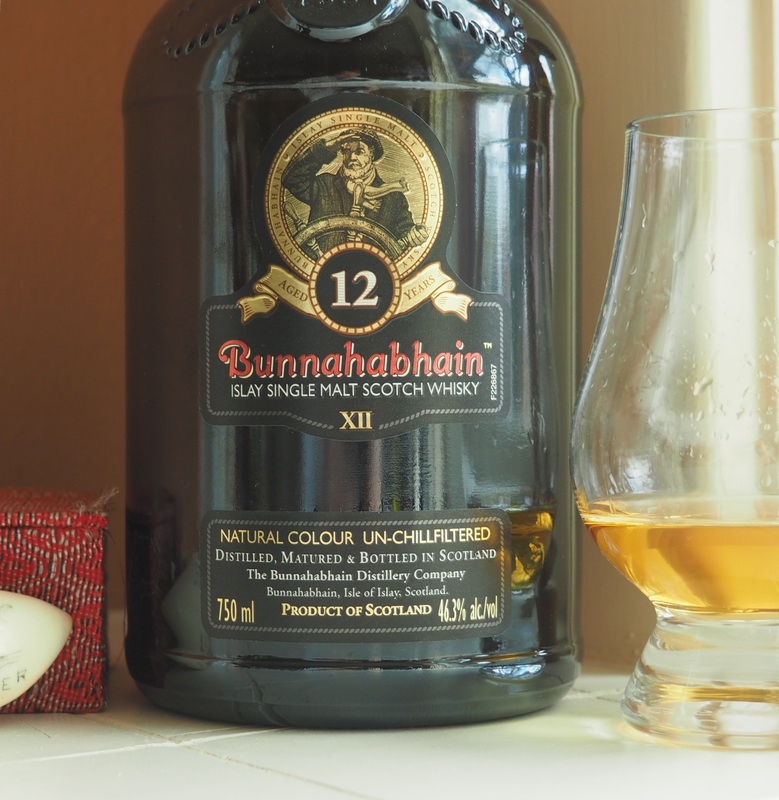 Maybe that’s all it takes – a guy outside a bottle shop saying: “Ahh that’d be Bunnahabhain”! Hey Nick thanks for dropping by. Well all palates are different, and in fact my tastes have expanded…Talisker is now one of my faves, as well as Ardbeg, Laga & Laphroaig. But Bunna has a place for me due to what you allude, subtleties.